Are Smaller Kitchens The Wave of the Future? I recently put together a comparative market analysis for homeowners in Northampton who are hoping to sell their home in the spring market. Their ranch-style house has 3 modest bedrooms (yet with a small en suite master bath) a relatively small eat in kitchen, some nice open common living spaces and a lovely back yard. I was struck by the functionality of their small, yet streamlined kitchen. I'm always impressed by friends and clients who have the vision to create beautiful and functional small spaces within their homes. We realtors are seeing a trend towards buyers (generally speaking) seeking homes that aren't overwhelmingly spacious. With more modest-sized homes comes smaller rooms, including the kitchen. 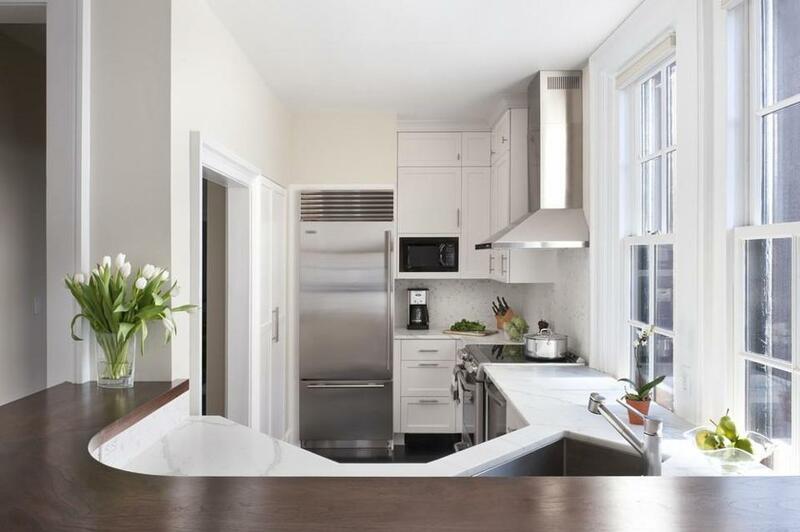 Local design writer, Debra Jo Immergut, recently wrote the following article for the Boston Globe, describing how to design a functional and great looking compact kitchen. As we move towards becoming a culture that is ever more mindful of waste, hyperconsumerism and keeping a check on our carbon footprint, the trend towards smaller kitchens may become more popular. Advice from the experts on creating a tasteful and organized kitchen when you're short on space. For the last decade or two, the dream kitchen has been bulking up. Peruse popular home-centric websites, and you'll see marble-topped islands big enough to merit their own coordinates on Google Maps, ranges with sufficient burner capacity to launch small rockets, and cavernous fridges that could double as bunkers. Yes, some people have kitchens on steroids. And some -- urban dwellers, tiny-house revolutionaries, and countless homeowners who simply live less large -- don't. The good news: The small-kitchen crowd needn't feel deprived. When designed for maximum efficiency and style, a more modest kitchen might even be considered the next big thing. "The kitchen is ever increasing in importance," said Treff LaFleche, principal of LDa Architecture & Interiors in Cambridge, "but the space being dedicated to it is changing dramatically." The new 21st-century kitchen is less focused on square footage and more on a general sense of openness, flow, and functionality, he said -- it's less about a huge footprint and more about "serving as the heart of the home." A few years down the road, a compact kitchen area may even be an attractive selling point. 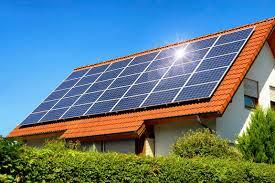 "Boomers are the ones with the money right now, but their millennial children are driving a move toward efficiency and sustainability," said Bill Darcy, CEO of the National Kitchen & Bath Association, a trade group of manufacturers and designers. Smaller spaces fit the lifestyle of a generation more encumbered with student debt and less enamored with sprawling dream homes, Darcy said. 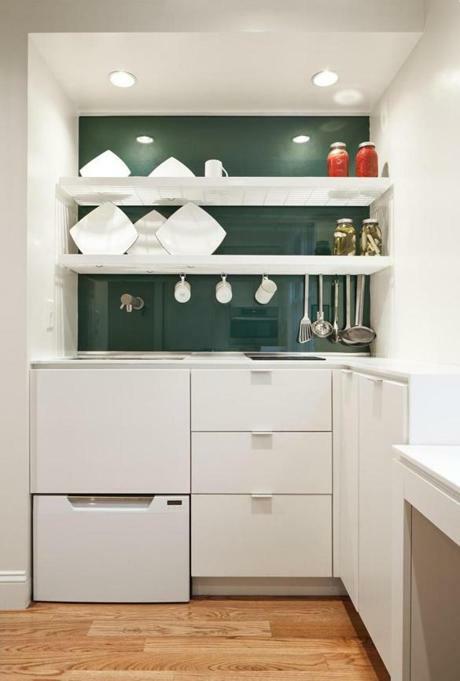 To make a small kitchen work, owners should plan a savvy layout and opt for simple aesthetics, said New York designer Young Huh, who sat recently on a trend-spotting panel for the association. "You have to make the most of your choices," Huh noted. One upside to remaking a tiny space: You might be able to splurge here and there. "You can really go for it and choose a beautiful floor tile, because it's not so expensive to order a small amount," she noted. So forget the vast culinary palaces of the Internet. Instead, make the cleverest possible use of the space you've got. But first, arm yourself with these strategies from kitchen-design geniuses. Even the tiniest space can be extremely functional if it's been fine-tuned to suit a family's daily routines. "Kitchens are very personal," said designer Emily Pinney, principal of Pinney Designs and owner of Cambridge boutique Syd + Sam. For example, "If your kids are always running in for drinks and snacks, maybe you need a refrigerator drawer that's really usable," Pinney said, noting that kitchen design should "be about what you really need in your life." Creative solutions define the kitchen Charlestown's Bunker Workshop designed for an in-law apartment in Duxbury. The occupants wanted a dish-drying rack similar to ones they'd seen in Italy, so interior architect Chris Greenawalt devised a slatted shelf unit to hang over the sink; it air-dries and stores dishes in the same spot. A deep-green glass backsplash protects the wall from stray droplets and serves as a focal point for the all-white kitchen. The couple made other requests for the space: They hoped for a kitchen island, a spot to sit and watch their grandkids play in the yard, and a full-size dining table. "We built a low, wheeled desk in front of the window where they could sit and have a glass of wine," Greenawalt said. The ingenious desk can then open into a table and double as an island work space. McMansion-dwellers may splash out on ornate cabinetry and crown molding, say designers, but in a small kitchen, it's best to keep it simple. "Go for a really good rhythm -- a line of cabinetry that's as clean and unbroken as possible," Huh said. If flat-panel styles are too contemporary, she said, Shaker is an ideal traditional alternative. Consider covering appliances with panels to match your cabinetry: "It makes the refrigerator door disappear," said Huh, "and makes the kitchen look larger." Hardware, too, should be as simple as possible, designers say -- or go without it, opting instead for touch-latch doors. Portsmouth, N.H.-based designer Patty Kennedy found the paneling principle at work in a New York City kitchen she helped style for a photo shoot; the walls, refrigerator, and cabinets were covered with anigre, an African hardwood, lending a seamless finish to a potentially awkward nook. In tight quarters, generously sized windows and pass-throughs can make a huge difference, as can white or neutral color schemes. 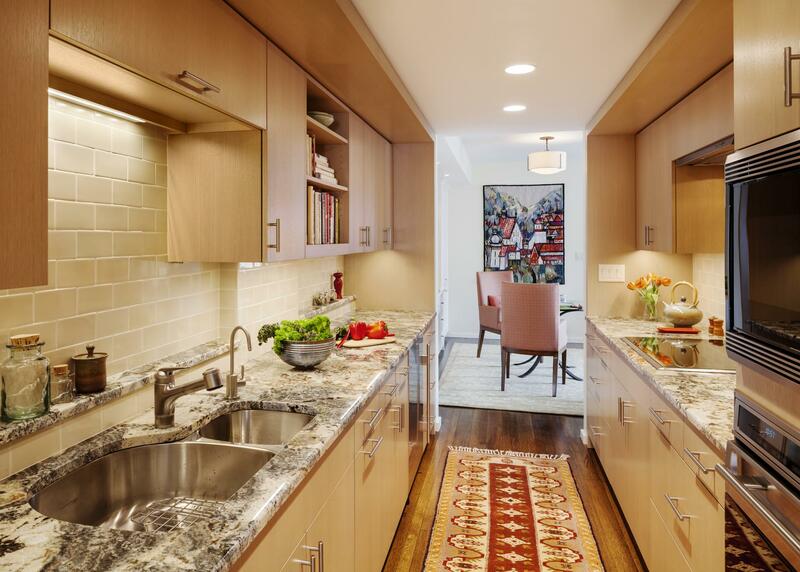 "I'm a big believer in bigger windows that sit right down to the countertop, opening up to daylight and the outside," said Pinney, who loves their effect in a white-on-white Back Bay apartment she designed. Even a tiny over-the-sink window can be enlarged to make a confined space appear more spacious, she noted. Sticking to the same materials and a neutral color works best in a diminutive space, "so your eye can focus and it's not all over the map," Pinney said. In the Back Bay kitchen, she used white Calcutta marble on the counters and white marble mosaic on the adjoining backsplashes, adding just enough visual interest while maintaining a restrained, unified scheme. As alluring as those blazingly powerful six- or eight-burner ranges may be, they're often not a great fit for many households. "I'm trying to get clients to consider using smaller appliances," Greenawalt said. "The way most people shop is changing, and the way we cook is changing as well." For smaller spaces, he prefers a separate wall oven and stovetop to avoid breaking up the counter lines. LDa's LaFleche does see more homeowners moving away from "that whole trend of the giant Sub-Zero refrigerators" and shifting toward "right-sizing their cooking and buying fresh." To that end, he often recommends small refrigerator drawers dedicated to produce or dairy that are closer to prep and cooking areas. In a small but inviting Cambridge galley kitchen, LaFleche specified an under-the-counter fridge, plus a smooth glass-topped stove and separate wall ovens. Greenawalt used a similar strategy in a loft apartment in Boston's Leather District. 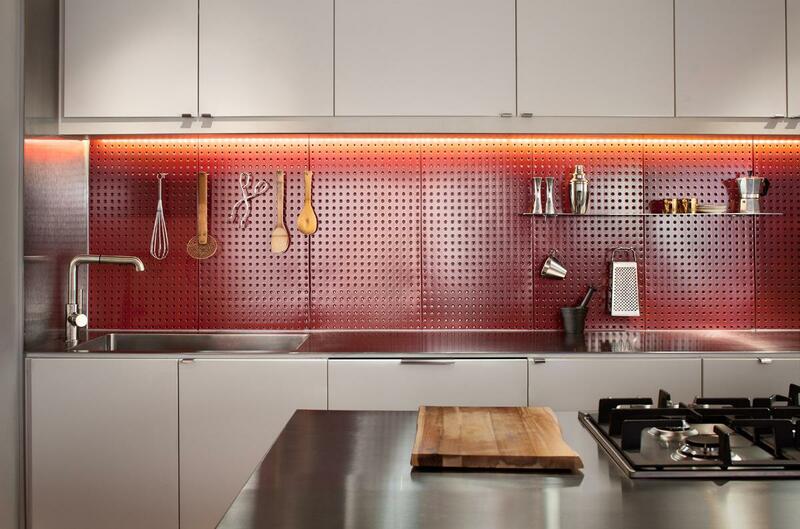 In lieu of a traditional backsplash, he installed panels of bright red perforated metal ("It's called AlligatorBoard, and people usually use it to hang tools in their garages," he said). Outfitted with pegboard accessories from the local hardware store, it serves as custom storage for kitchen utensils and other small gadgets. Most important, LaFleche said, is to think hard about what you actually need to store. "We're seeing the reverse trend from the '80s, '90s, and early 2000s, when the goal was to put everything in the kitchen." He advises clients to divide gear into categories and keep items that might be used only every few weeks or months elsewhere: "They might move out to the closet or the hallway." Besides, if you're truly into cooking, he suggested, "the only thing you might really want is a set of knives." And, on a related note, if you're truly just into eating, the only thing you might really want is a set of takeout menus -- and happily, those take almost no space to store. 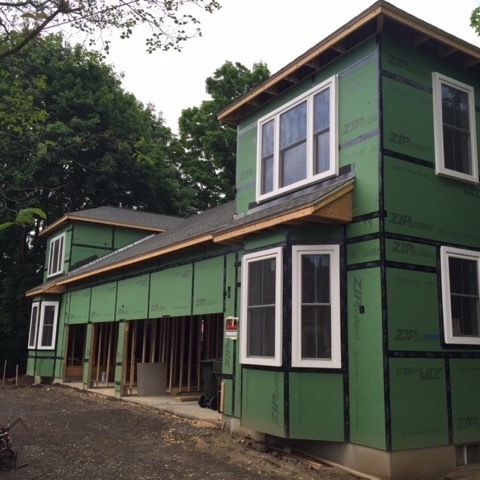 51 Phillips Place was in need of a lot of TLC when Linda Muerle purchased it back in 2013. The house was rich in local history, full of lovely original architectural details, and set on a sizeable lot. Linda had just sold the last of 6 units at her condo complex around the corner at 90 Pomeroy Terrace (formerly the Northampton School for Girls - another lovely historic building), and she was looking for a new project. Linda Muerle is a licensed and trained architect, owner of the local company Consulting Design, and she is drawn to beautiful older homes in need of a new purpose. 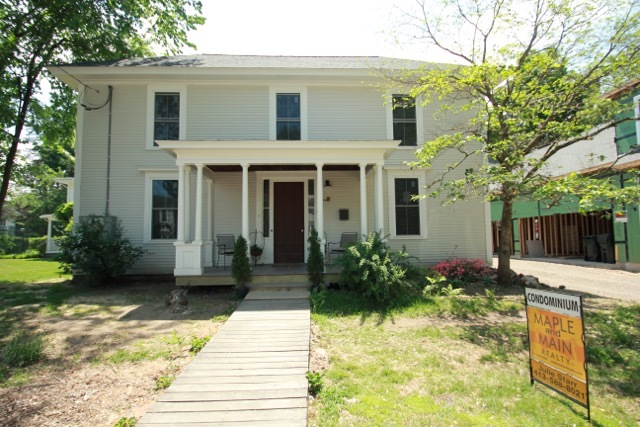 The original house at 51 Phillips Place was built in 1848, and Linda's purchase of the property coincided with the new zoning in Northampton which encourages infill. She was able to complete a gut renovation of the existing structure, preserving some original floors, moldings, doors and staircases - and transform them into 2, beautifully appointed and energy efficient condos. In addition, the size of the lot allowed her to build 2 brand new townhouses on the same property. 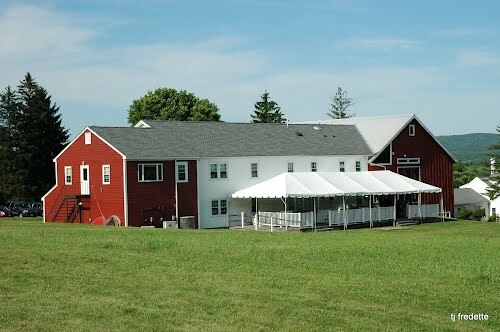 OPEN HOUSE FOR UNITS 1 and 2 THIS SATURDAY, MAY 30th FROM 1 - 3 PM! The new construction at 51 Phillips Place - Units 3 and 4. The interior of Unit 2, housed in the original structure. 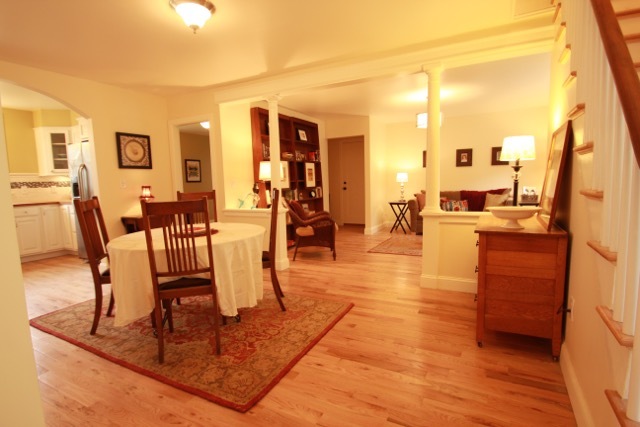 Original posts and stair rail were able to be incorporated into the design.